Today, we’re sharing with you our latest visit to Garden Grill Restaurant for Chip ‘n’ Dale’s Harvest Feast Dinner! Garden Grill is basically one of my favorite character meals. First, it’s a character meal with really great interaction. And while Chip ‘n’ Dale are the headliners, here, you also get to hang out with Farmer Mickey and Pluto! But beyond the characters, we enjoy the unique ambiance that Garden Grill offers. 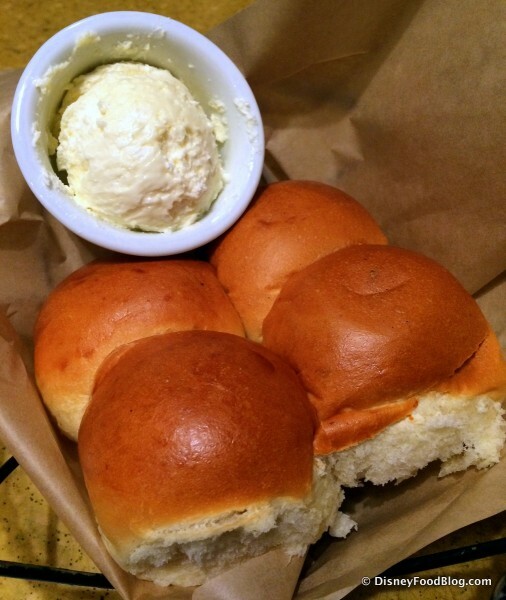 If you’ve never visited the restaurant, wait ’til you see what it does! Yes — DOES! We’ve also had some pretty fantastic meals here. Breakfast is virtually a tradition for my family. But today, we’re visiting in the evening. We’ve enjoyed past dinners here. Let’s see if the trend continues. Looking for Garden Grill Restaurant? 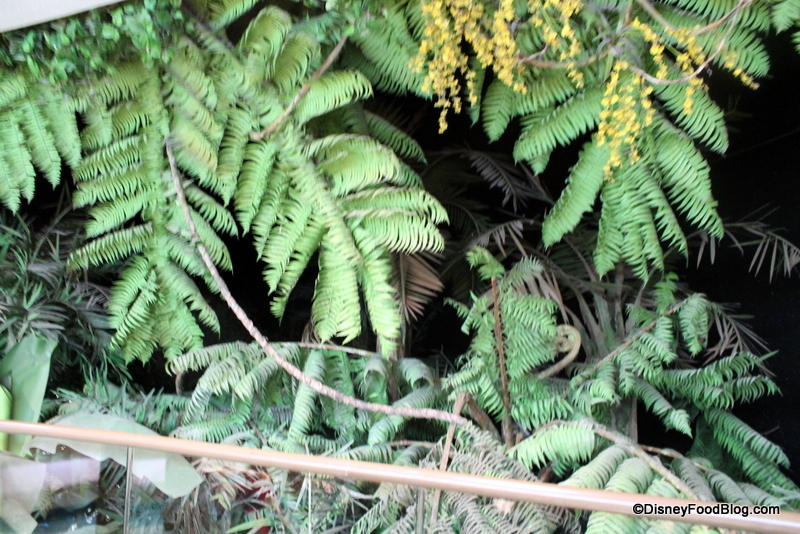 Hang a right after Spaceship Earth and head toward The Land Pavilion in Future World West. 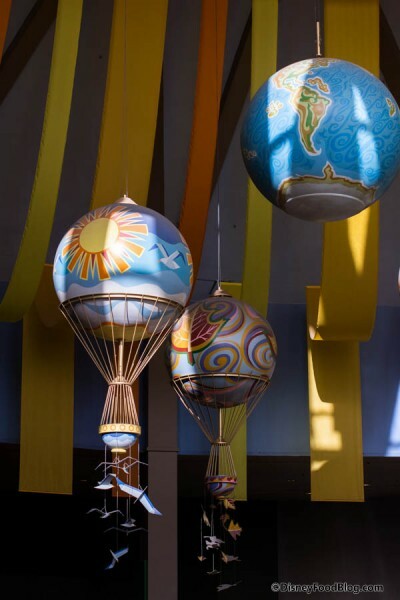 Walkways line the perimeter walls inside the building and lead you down to the pavilion’s three levels, which hosts Living with the Land, Soarin’, and Sunshine Seasons (one of our favorite counter service spots) on the bottom. There’s also an elevator if you’d prefer it to walking. You’ll find the Garden Grill directly across from the entrance. And here’s where we talk about what Garden Grill does: it rotates. In fact, it’s the only restaurant in Orlando — and only one of a handful in the world — that spins. Now, just in case the thought of a rotating restaurant doesn’t sound all that appetizing, we promise you that Garden Grill spins at a snail’s pace. We aren’t talking spinning teacups here. Why does it spin? 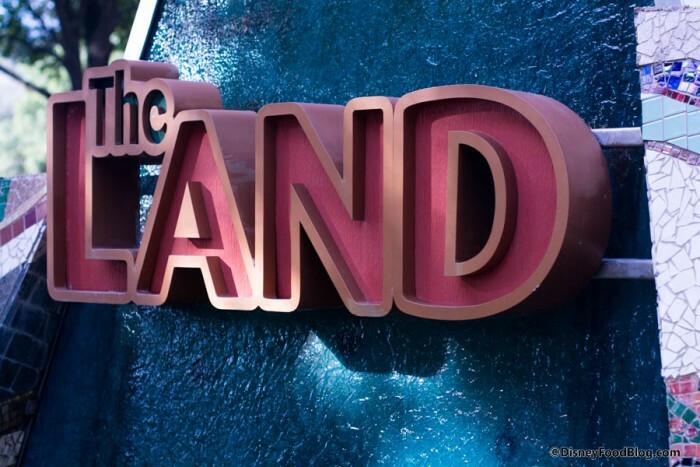 Well, there’s more than one way to check out the attractions within Living with the Land! 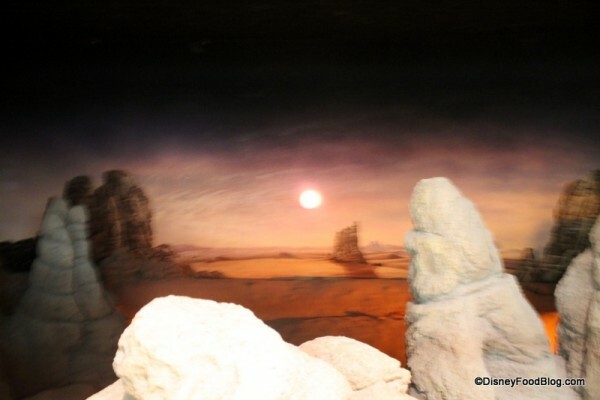 As the restaurant rotates, guests are treated to scenes from the ride. 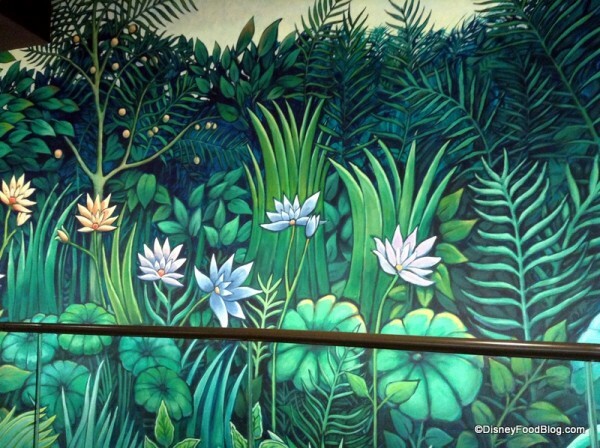 This mural acts as sort of a gateway. 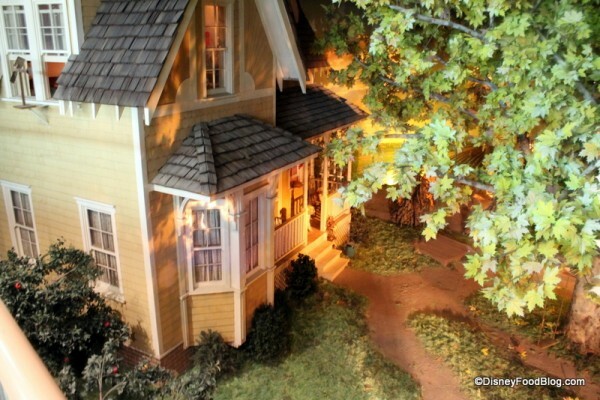 You’ll visit a farmhouse — or see it from above, anyway. I think this scene is particularly fun, because you get to look inside one of the windows from this vantage point! You’ll also see extremes in landscapes. As you view a rainforest scene, and watch it morph into a desert scene as you travel. Your vehicle for sightseeing is your table, of course. Tables are arranged in a sort of stadium seating pattern on two levels around the restaurant. 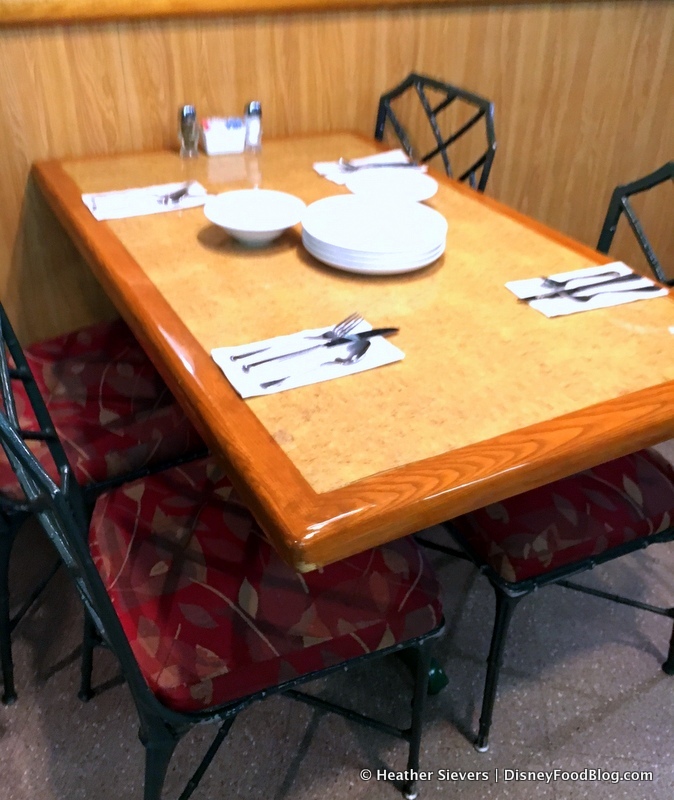 Top tier tables are your garden variety rectangular tables, like you see here. 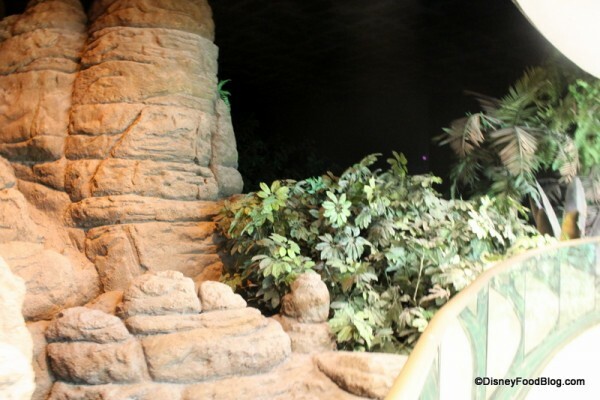 On the lower level, semi-circular booths face out, giving you the best view of the scenes you pass. And that brings me to Reason Number Two that you might want to visit Garden Grill: the characters. Let’s check ’em out. One of my top reasons for visiting Garden Grill is the character interaction. 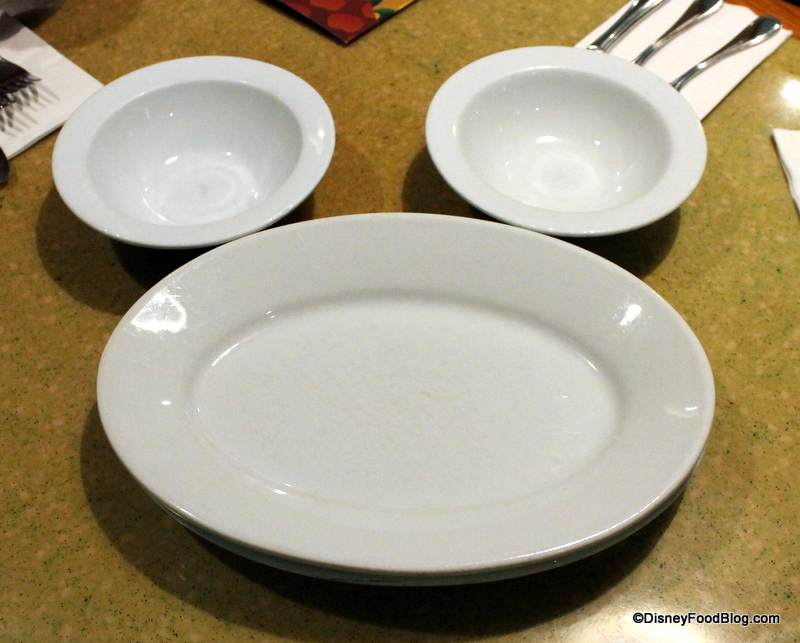 In fact, it’s one of my Top Two Favorite Character Meals in Walt Disney World! 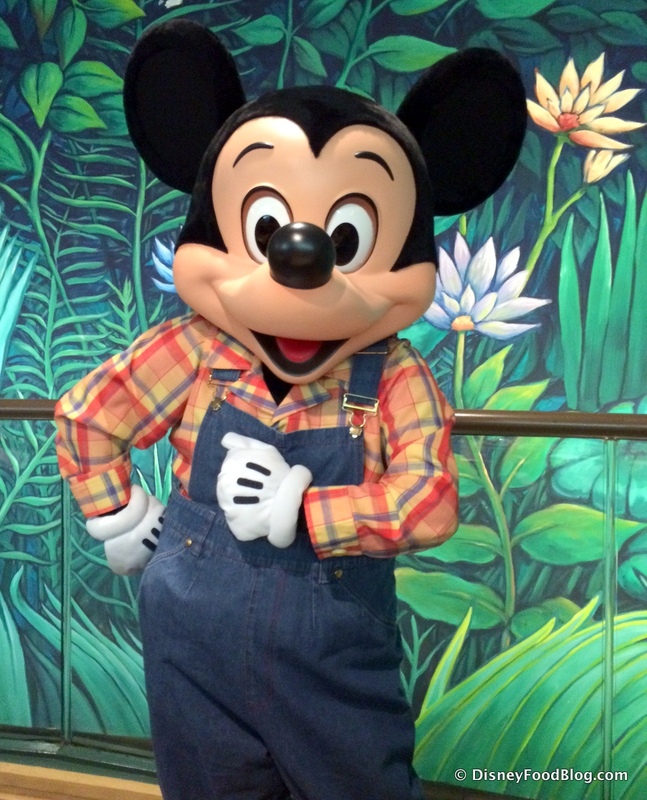 Of course, I love when I can see Mickey during a character meet and greet. And here, he’s dressed in his farmer finest. 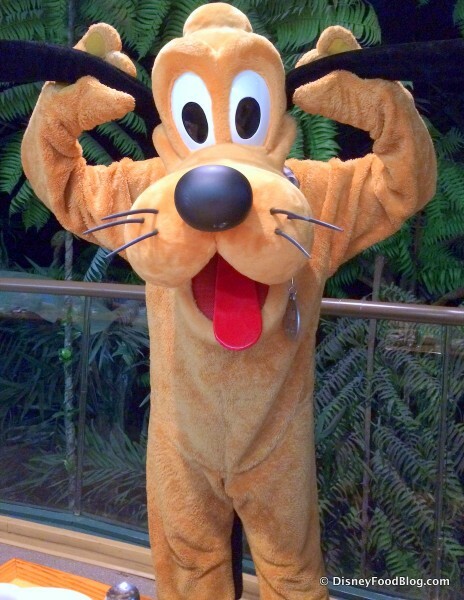 Mickey is joined by his faithful pup sidekick, Pluto. 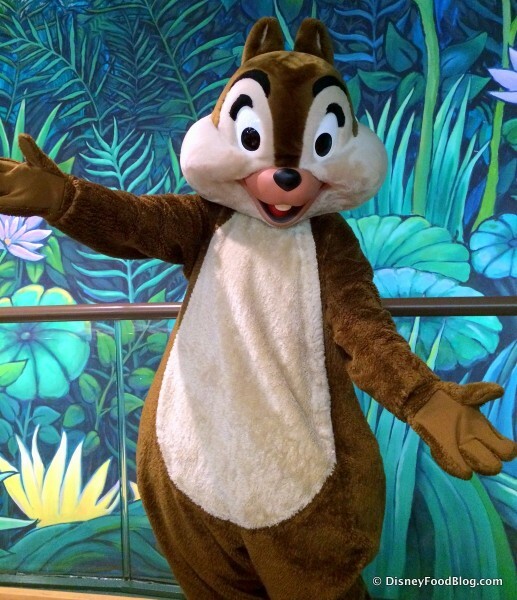 But this is, after all, Chip ‘n’ Dale’s gig. So you’re sure to see the playful pair as you enjoy your dinner. And that’s one of the coolest things about Garden Grill — it’s not just the stellar character interaction, but the amount of interaction you get. The restaurant is fairly small in size, so that means you normally have the chance to visit with characters more than once during your meal. So we’ve talked about the fact that Garden Grill rotates, thus making it something kinda special. 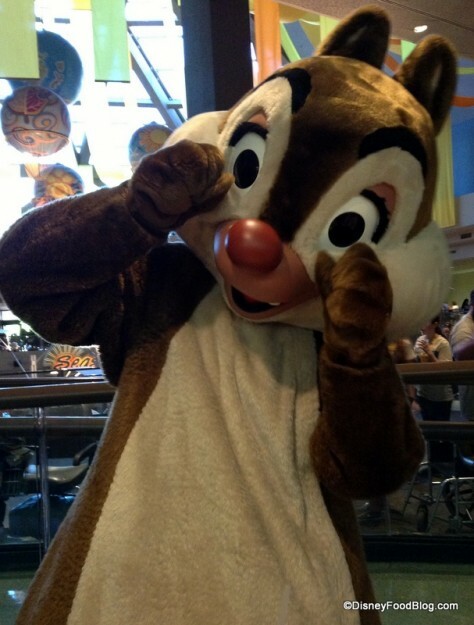 And, of course, any day that you can share your meal with Chip ‘n’ Dale and Friends is gonna be a good one. But how about the food? Well, the good news is — that’s pretty great, too. Garden Grill serves its meals family style, meaning that shareable platters are brought to the table, and you can ask for more of anything you like. 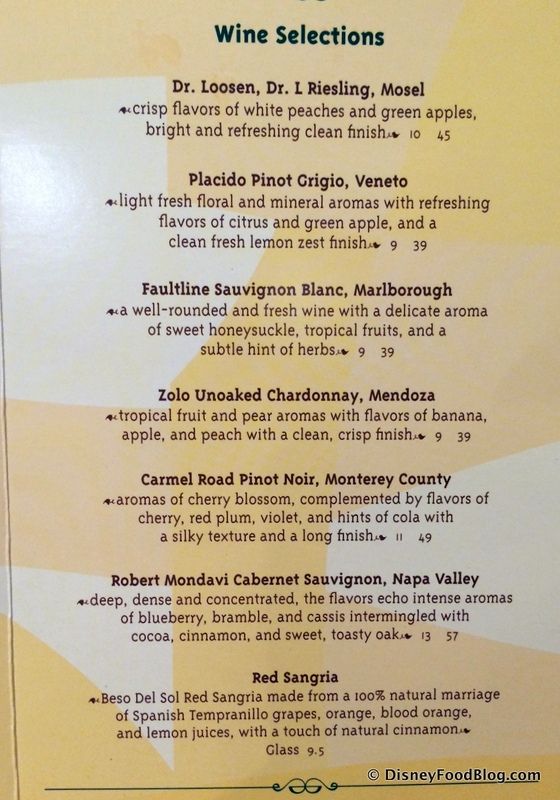 That also means that everyone dining has the choice of a non-alcoholic beverage as part of the prix fixe price of his or her meal. 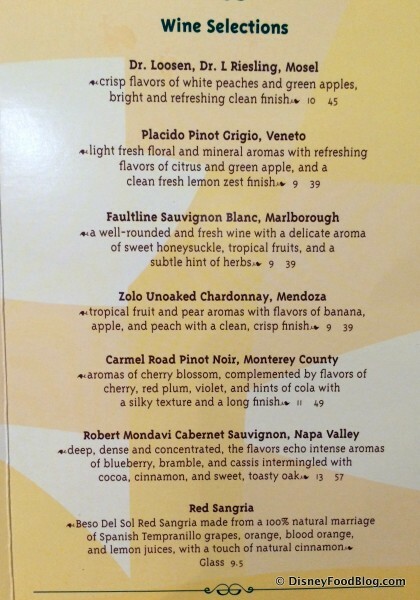 But if you’d like, you can also order from a list of special drinks, including cocktails, mocktails, beer, and wine. You don’t really choose what you’re getting at Garden Grill (unless you have special dietary needs; talk to your server in that case). The offerings are pretty much standard. You’ll start with warm Dinner Rolls, served with a side of Whipped Butter. Next comes the Harvest-Inspired Farmer’s Salad. 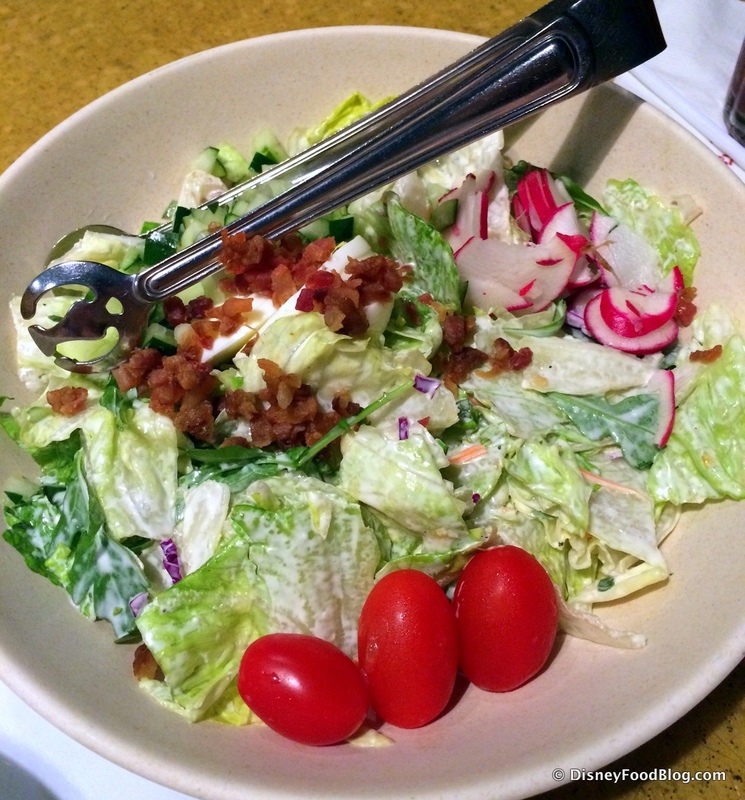 During our visit, the salad included greens, hard boiled egg, radishes, and grape tomatoes. It’s lightly dressed with a creamy dressing. The main course is the combination platter with sliced Homestyle Pot Roast, sliced Turkey Breast, and Italian Sausage served with sautéed Peppers and Onions. 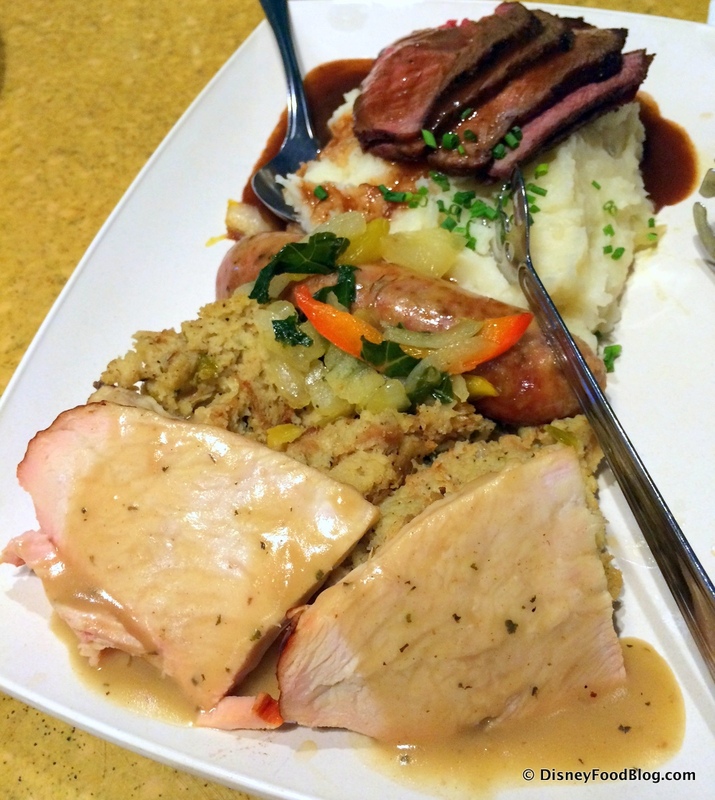 Sides on the platter include Mashed Potatoes and Bacon and Leek Stuffing. The Italian Sausage is new, having replaced the previously served Sustainable Fish of the Day. But that’s not all. 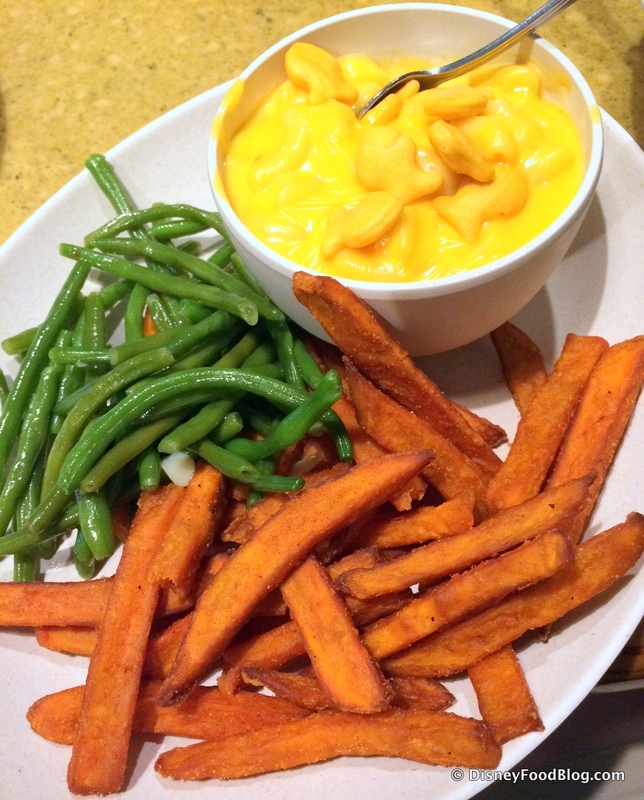 You get additional veggie sides, like Green Beans and Sweet Potatoes, plus Macaroni and Cheese. For dessert, it’s a shareable Short Cake topped with Fruit Compote and Vanilla Bean Whipped Cream. Some folks may call this a cobbler. 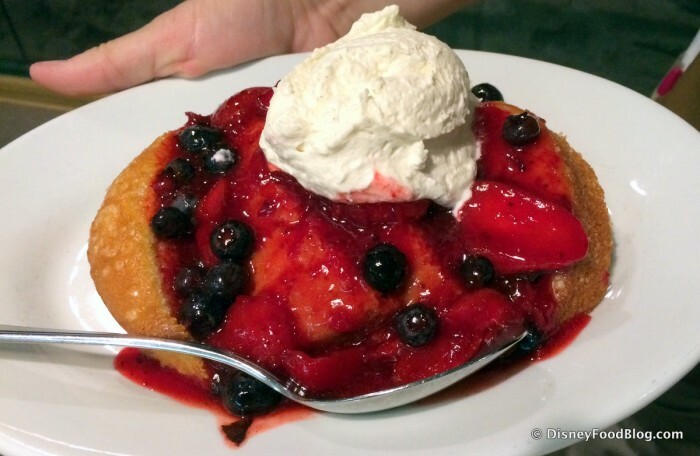 Whatever name you give it, the rich cake and super saucy berry topping is a winner with everyone at the table. You’re touring Epcot with small children. 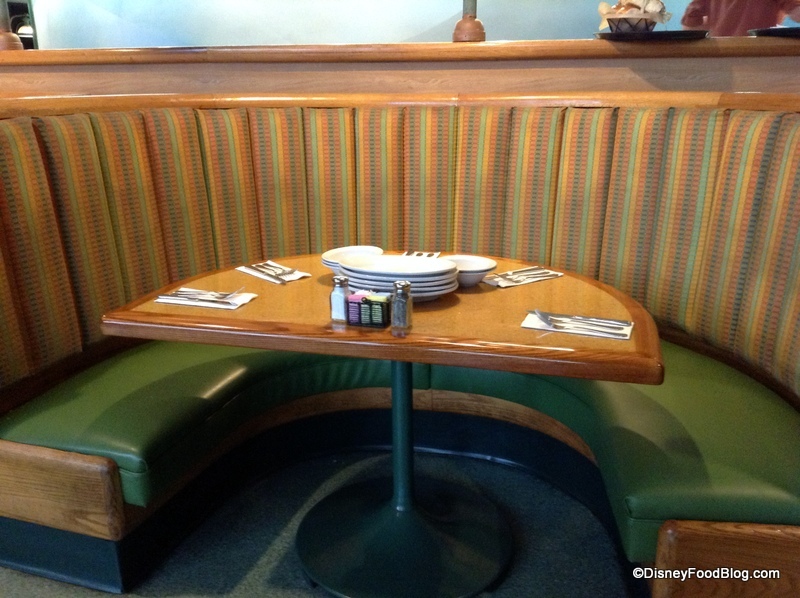 The rest of the table service restaurants in Epcot can be ho hum for little kids. After lots of visits, I still love Garden Grill Restaurant. I think I’ve laid out a pretty convincing argument. 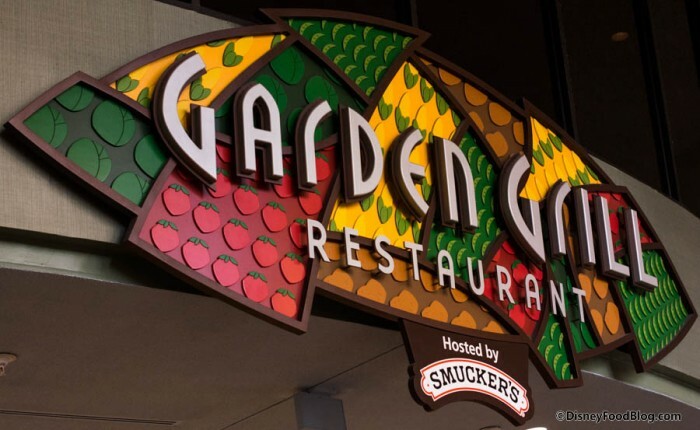 When you visit Garden Grill, you’re getting a three-way combo of unique environment, great characters, and excellent (and plentiful) food. And when it comes to characters and kids, I personally lean toward a character meal where the food comes to you, because it’s so much easier to juggle kids, characters, and food when you don’t have to worry about visiting a buffet. But even beyond the convenience of Garden Grill, the characters, and the novelty of the place, I think this place just offers really great food. It may be kind of standard fare, but it’s thoughtfully prepared. 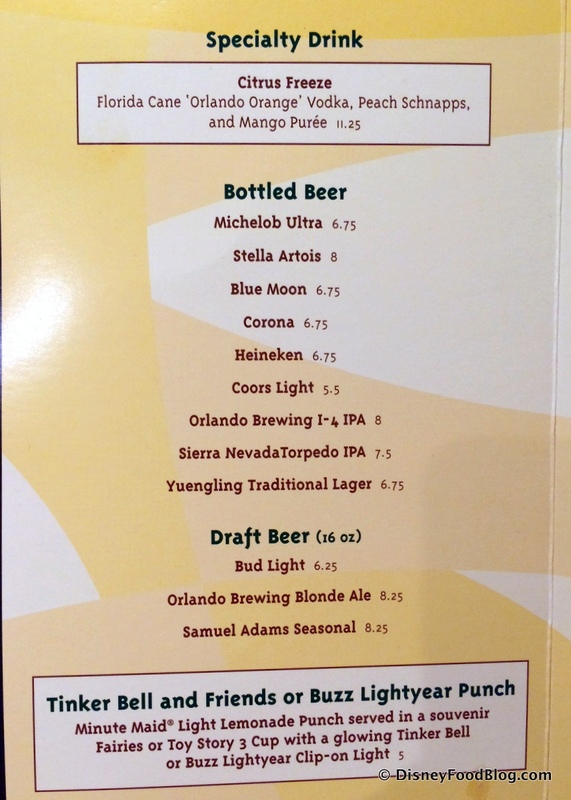 And when you’re paying Disney prices, it’s great when you can enjoy a character meal as much for the food as for everything else. If you haven’t tried it before, book an advance dining reservation for Garden Grill Restaurant. I think you’ll be pleased. 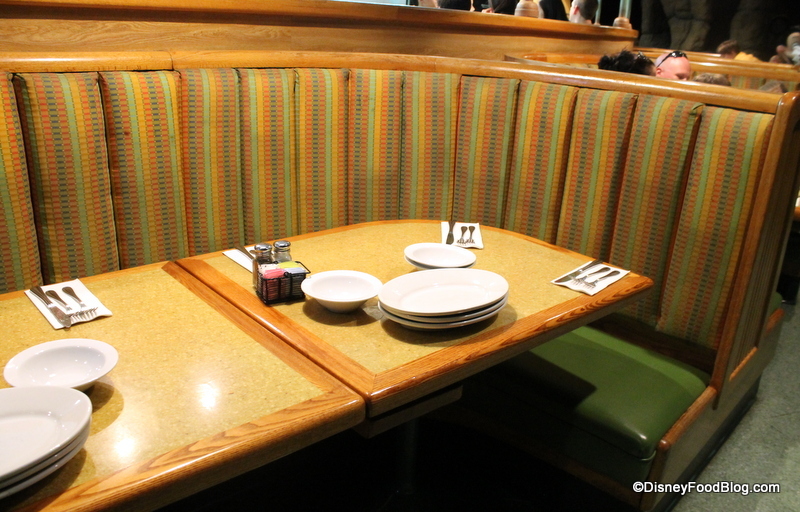 Read Our Review of Garden Grill’s Breakfast Options Here! Now, I’d love to hear from you! 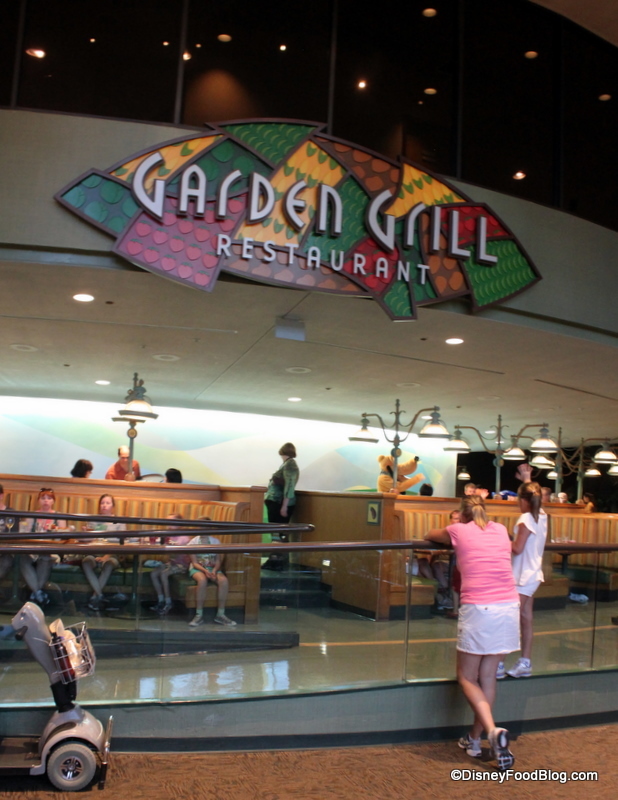 Is Garden Grill Restaurant one of your favorites? Let us know in comments!